I expect that I will discuss probit recession models further in later articles, but I first want to have a long detour to discuss the use of the yield curve as an input to those models. It is not surprising that the yield curve has worked as a recession indicator, but we need to be cautious about it -- particularly if one is a bond market participant. One of the awkward problems with discussing the "yield curve" in this context is that economists tend to use the term sloppily. From the perspective of fixed income, a yield curve is the modelled yield for an issuer which spans the full continuum of maturities from overnight to infinity (if the issuer has perpetuals or consols). The fact that it is issuer-specific means that a single currency can support a multitude of yield curves. However, in the context of business cycle analysis, economists tend to refer to the difference between two maturity points on the curve -- a slope -- as the yield curve. (Since there is theoretically an infinite number of slopes*, using the definite "the" adds to the confusion.) In fact, I will myself refer to such slopes as the "yield curve" in most business cycle discussions. However, if we want to dig into the topic, we need to keep the concepts separate, and I will do so for the remainder of this article. Since the PCA analysis is done on changes in the slope, we need to be somewhat cautious about inferring anything about the actual shape of the yield curve based on the PCA factors. However, one could suggest that since slope changes are related to the movement of the slope PCA factor, it would not be too surprising that the levels of various slopes are at least correlated with each other. That is, if we are using a slope as an indicator, we should not be too surprised if many other slopes from the same curve will have similar success as an indicator. If one is just looking at slopes as a visual indicator, the correlation of various slopes is not an issue. However, probit recession models are trying to align continuous variables to the binary recession indicator variable (with varying lags). The ability to mine the yield curve to get a particular slope that performed best historically creates a distraction from a more fundamental issue: why will any slope work as a recession indicator in the first place? the central bank is either cutting rates when there is no recession, or hiking rates when there is a recession. There are some other technical issues that also can show up. 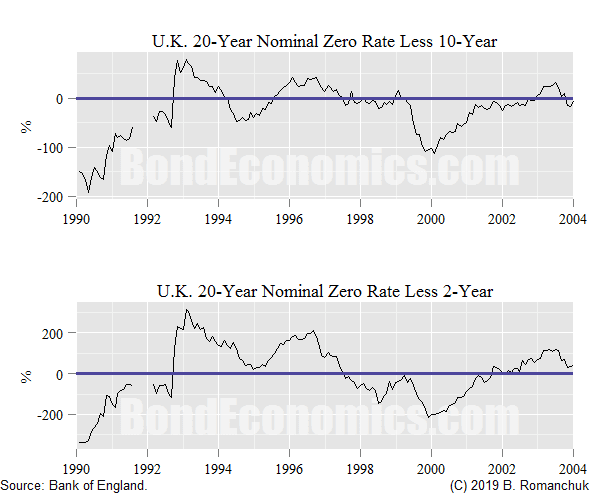 It is difficult for bond yields to get very negative, and the usual course of action of central banks is to slap the policy to 0% and leave it there. (For example, Japan historically, the United States post-crisis.) Since the usual assumption was that rates could not go down -- but could go up -- yield curves in this situation were normally upwards sloping regardless of the economic situation. I am not a big fan of various term premia models that are floating around academia. However, it is clear that yield curves can get quite distorted. The distortions in the gilt curve can be traced to the demand for duration created by liability-matching rules for pensions. Pension funds were forced into a tiny market, and prices were bid to stupid levels. This distortion at the long end will then affect slopes such as the 2-/20-year slope (bottom panel). So long as we stick with maturities at 10 years or below, we should avoid the severest distortions, but one never knows what may happen. If we look at curves where there is a credit risk -- such as euro area sovereigns -- curves may invert as a result of credit risk. This inversion does not really tell us anything about the path of the policy rate. The mechanics of inversion are straightforward. When an issuer defaults, bonds have a recovery rate that is some fixed percentage of the par value. This means that all bonds of the issuer will trade at the same price, which is at a discount to par. In order for a short duration bond to have the same price as a long duration bond, it has to have a much greater rise in yield. Hence, short-dated yields are higher than long-term, and the curve tends to be downward-sloping,. The effects of credit risk may also corrupt some slopes used in analysis. For example, for many countries, it is easier to find short-term rates with a credit component than time histories of treasury bills. This means that economic analysts may take the slope between a risky short-term rate and a risk-free long-term bond. Is There a Fundamental Link Between Slopes and Recession? Finally, it is not hard to find analyses which are based on the premise that slopes can cause a recession. The alleged culprit is that banks become less willing to lend, since their short-term liabilities are at a higher rate than long-term fixed income assets they can invest in. If we go back to the highly regulated financial systems before the 1980s, there may be an element of truth to that story. My argument is that garbled versions of that 1970s logic survived in textbooks somewhere, and market participants keep repeating that folk wisdom. The reality is that modern banks duration exposures are very carefully monitored internally and by regulators (as a result of historical blow ups). If the bank has properly immunised duration risk, the spread between its cost of funding and its lending opportunities is not affected by the yield curve. This article outlines some of the issues around the use of slopes as recession indicators. I will be filling in more details as the draft of my book advances. * There is an infinite number of maturity points for ideal mathematical yield curves. However, bonds settle on particular days, there is a maximum of 365 (366) maturity points per year. Since not all curves support perpetuals, one can argue that the true number of maturity points is actually finite. ** Repo is the bond market short hand for a repurchase agreement. Money market investors can lend against government bonds in the repo market to get a highly guaranteed short-term instrument. The first line of defence is that the "borrower" in the repo market is obligated to repay the "loan" -- regardless of the status of the bond. The second line of defence is that the bond is held as collateral, and the bond itself is guaranteed by the central government. Unless legal risks around the agreements pop up, a repo has theoretically less credit risk than even the central government.